Put all of the ingredients, except the pine nuts, in a food processor outfitted with the “S” blade, and pulse a few times to begin chopping the basil leaves. Add the pine nuts and process until the desired consistency is achieved. Do not over process the mixture, or the oil from the pine nuts will separate, and the mixture will become too oily. The texture should be creamy with tiny specks of pine nuts throughout. 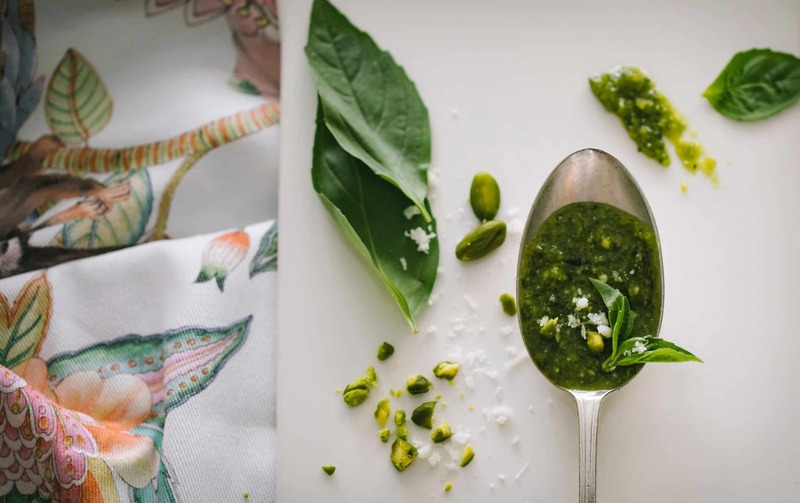 Storage suggestion: Stored in a sealed glass jar in the refrigerator, pesto sauce will keep for 4 days. Pesto can be frozen in ice cube trays. Store the cubes in a sealed container in the freezer for 3 months. Delicious with spiralised vegetable pasta.